CFD Direct From the Cloud (CFDDFC) is our complete OpenFOAM cloud computing platform that includes the latest version of OpenFOAM and supporting software, e.g. ParaView, Scotch, OpenMPI, etc., running on the latest long-term support (LTS) version of Ubuntu GNU/Linux. 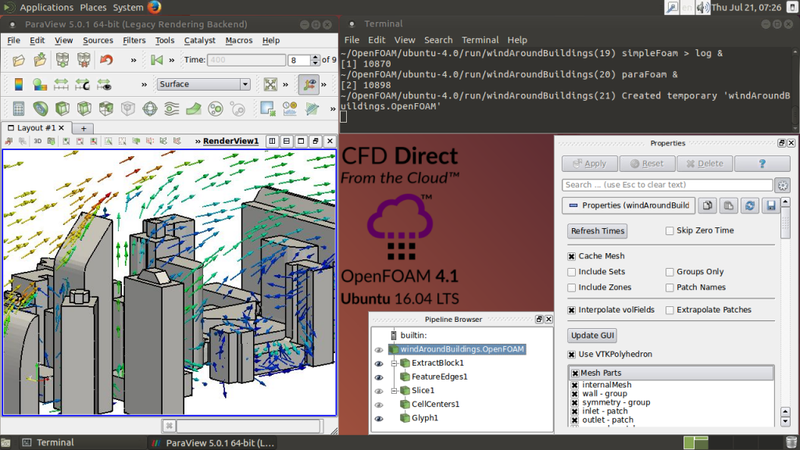 In Year 2, we updated CFDDFC to OpenFOAM 4.0 and 4.1, running on Ubuntu 16.04. Feedback from users has continued to be very positive, including a 5-star rating on the CFDDFC Marketplace Product page at at Amazon Web Services (AWS). CFD Direct became a Technology Partner of AWS and was later promoted to the Advanced Tier of Technology Partners . The Advanced Technology Partner status and listing on the Amazon Partner Network recognizes our success in bringing CFD to the Cloud on AWS. CFDDFC is supplied for Amazon Web Services (AWS) as a product on AWS Marketplace, with the software pre-configured as an Amazon Machine Image (AMI). Anyone wishing to use the software simply needs to setup and configure as a AWS user, then launch an instance of the AMI on Amazon Elastic Compute Cloud (EC2). We produced a case study on the cost of CFD on AWS EC2 that looked in particular at the cost of Spot instances: spare EC2 instances that users can bid for, whose price fluctuates based on the supply and demand of available EC2 capacity. The study involved an 8 hour simulation of external aerodynamics of a car, using an 18 million cell mesh, running on a c4.8xlarge instance in parallel with 18 physical cores. The total cost using On-demand pricing was $17, compared to $6 with Spot pricing. We estimated that the cost using AWS EC2 Spot instances was approximately 40% of the total cost of ownership of on-premises hardware. We made CFDDFC available on X1 instance types which offer up to 64 physical cores on a single instance. We tested the instance types by simulating tank sloshing in zero gravity in parallel on 32 cores using the x1.16xlarge instance. We then configured a simulation of a propeller with a mesh of 14 million cells which we ran on the x1.32xlarge instance in parallel on 64 cores. Videos of the simulations are shown below. 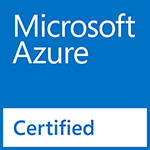 We released CFDDFC on Microsoft Azure as a Marketplace product which is Microsoft Azure Certified. The same software — latest version of OpenFOAM and supporting software running on Ubuntu GNU/Linux — is provided through a pre-configured Virtual Machine (VM) image. Users create a virtual machine on Azure, where Azure VMs include D G and F series, currently with 32 CPU cores at the largest size (G5).